Supply Chain Management – all the coordination, planning and management of everything involved in sourcing (from your suppliers and your suppliers’ suppliers) and purchasing, manufacturing or production, and logistics activities – to get what you need from your suppliers to your customers. Six Sigma – tools/techniques for process improvement. Six Sigma looks to improve the quality of any process and its outputs. Six Sigma tools identify and remove the causes of defects or errors, depending on what process it’s looking to improve, and minimize variability. Kaizen – Japanese for “good change.” Six Sigma folks will put together a kaizen event to make an overhaul to a process, using their Six Sigma processes and a strict, measurable timeframe. Reverse Logistics – what it takes to manage the reuse, refurbishment or otherwise value capture or disposal of products. Reverse logistics is basically how you handle when you normally ship something to a customer and now you’re either getting it returned or you’re moving it to a new destination for some other downstream purpose. OTD – On-Time Delivery. What you probably don’t have from your suppliers or to your customers if your supply chain isn’t as tight as a John Elway spiral. Safety stock (versus re-order point) – inventory you keep for emergencies (versus the point at which you re-order to replenish for normal business operations). People often use these two terms synonymously. People also often text while driving, salt their food before tasting it and start world wars. Supplier Agreements (also – Master Agreements, Quality Agreements, Scope of Work, Scope of Services, Statement of Work, etc.) – think of these as pre-nups. You don’t want to draft one of these yourself and, if everything goes swimmingly, you’ll never need to refer to it. But if your company pays suppliers for goods and then ships said goods to a customer, you might want someone to work one or more of these up for you. Sometimes P.O. terms and conditions can be used instead of one of these agreements. And sometimes the Cubs win a World Series. PI – Physical Inventory. The process of counting, recording and reconciling every part you stock (that you have, will have or had the ability to sell). Sometimes, if you go to a mall just as it’s closing, you can see the employees at The Gap getting ready to spend their night doing this. Don’t let the dread in their expression fool you – your PI will be worse. It will be horrible. It will be disappointing and mind-numbing and no amount of coffee will get you through it with a smile on your face. But you will have to do this at some point. Cycle Count – …or just keep reading. When you lay out a plan to count just a few items a day or week but that ultimately add up to counting everything once a year, most banks, accountants, and auditing firms will allow this to replace an annual PI. This process of counting a prescribed number of items over a regular cycle is called cycle counting. If you work for Harley Davidson, there’s a pun in there that probably gets old pretty fast. FOB – freight on board. One of several acronyms in the Incoterms family. You don’t pronounce FOB as fob but you do pronounce INCO in Incoterms as ink-oh (it stands for International Commercial). Incoterms answer the question, “When your company buys a thing from a supplier, where do you take ownership of it?” When it leaves the supplier (ex works/EXW)? When the supplier puts it on a truck/ship/airplane (FOB)? When it arrives at your port or facility (CIF – cost, insurance, freight – or DDP – delivered, duty paid)? Or about a dozen other Incoterms. Each has its benefits and drawbacks and, like everything else in life and business and supply chain, is negotiable. Sheet-to-floor/Floor-to-sheet – back to inventory. As hard as it may be to believe, there’s more than one way to count your things. Sheet-to-floor is when you print out some kind of inventory report and then go out to the floor to count, using that sheet as your guide. Floor-to-sheet is going out to floor first and counting what’s there, and then comparing that to what your inventory control system says you have. These are complete oversimplifications of counting processes. Metrics - the data you can use to tell you how you're doing. On-Time Delivery, Back Orders, Backlog (yes, there's a difference), Scrap, etc. Good metrics tell you how you were doing. Great metrics tell you how you are doing. Cross-Docking - Your supplier's truck shows up. You unload the shipment. Instead of putting the delivery into your inventory, you move it "across the dock" into a truck, ready to deliver to your customer. Cross-Docking saves time and is often used to help expedite customer deliveries. 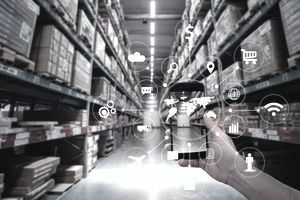 But you've got to make sure your inventory accuracy, inventory control, your receiving and shipping and invoicing processes all hold up during a cross-dock.